Knots are important in beadwork and jewelry making. In beadwork, they can be used when adding and ending thread. The type of knots used can vary depending on the stitch you are using, the type of thread and bead sizes. Using the right knowledge and making it correctly can help prevent your thread from unraveling and make your beadwork last longer. When stringing beads, knots can be used to fasten the cord ends or in between beads to help cushion them and prevent them from scattering in case the stringing thread breaks. Knots can also be decorative in addition to being functional. The lark's head knot is a good example of a knot that is easy to tie and secure but also looks great as part of a design element in jewelry. Take the time to review these knots and practice tying them. While it can be tricky to learn how to tie a good knot when doing beadwork, it will greatly improve the quality and durability of your work. An overhand knot is used frequently in jewelry making and beadwork and is a very simple knot to tie. In bead stringing, it is used to make knots between beads for decorative effect or to keep them secure. It is also used in stringing at the end of a cord or to attach a cord to a clamshell beading tip. The overhand knot is very similar to the half hitch knot, with the primary difference being that a half hitch knot is tied around something such as another cord. Overhand knots can also be used on a cord that is doubled to create a loop that can be used to make a clasp, such as when working with leather cord. Square knots can be used to add new threads in beadwork. They are a good choice when working in open weave stitches such as the netting stitch and the right angle weave. They are very secure and very easy to hide in between beads or even inside of seed beads. Square knots are used in a variety of beadwork and jewelry making projects—mainly to secure cord ends or attach new cords. A surgeon's knot is one of the trickier knots to learn, but it is very secure. 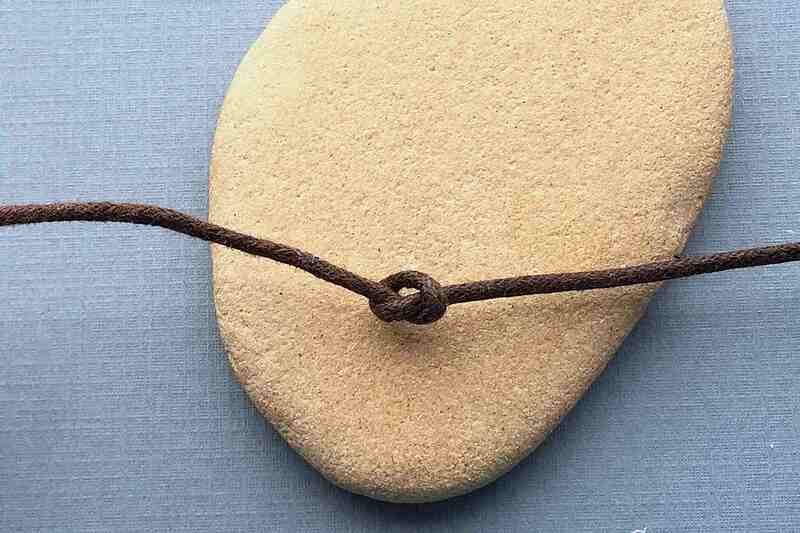 It is similar to the square knot with an extra loop through the base. Surgeon's knots are very useful in situations when other knots can untie, such as working with elastic cord in stretch bracelets. A half-hitch knot is one of the most commonly used knots in beadwork. It is used to add a new thread as well as tie off and end threads with most beadwork stitches. It works very well when used in multiples to add and end new thread in your beadwork, and with a small drop of glue or fresh, clear nail polish can be just as secure as a square knot or surgeon's knot. A lark's head knot is a very easy knot to tie. It is used to attach cords in beadwork, macrame and jewelry making. Half hitch knots can be useful as well as decorative. It is a good knot to use to add a pendant to a necklace or a focal point to a bracelet because it looks pretty and is secure. With a lark's head knot you can make a simple pendant necklace or an interchangeable donut bead bracelet.